St. Patrick’s Day is March 17. In 2019, it falls on a Sunday, which may make it easier for people to celebrate the holiday. Restaurants and retailers are already planning their St. Patrick’s Day specials and sales, giving you an opportunity to figure out where you want to go and what you want to do in advance. Various restaurants and retailers are planning to offer customers freebies and discounts to get them in the door this St. Patrick’s Day. Some even have special items that are only available this time of year. Here is a look at some of the most exciting options available in 2019. For a limited time, you can get two green cheeses – the English Sage Derby and the Pesto Gouda – at Aldi for just $3.99. They also have an Irish Cheese Truckle Assortment for $3.99, an Irish Cream Cheesecake for $8.99, and an Irish Soda bread for $3.99, all in celebration of the holiday. Through March 24, you can buy a Mint Chocolate Shake at Arby’s. If you are looking for a green beer this St. Patrick’s Day, Bar Louie has you covered during the St. Patrick’s Daze celebration, which runs from March 15 through March 17. A chain with Irish roots, Bennigan’s is offering the Lucky ’76 Meal Deal to celebrate the holiday. With the deal, you get an appetizer or dessert and two entrees for just $19.76. Some locations will also have other special menu items, like corned beef and cabbage or beer cheese soup, as well as other Irish-themed drink specials. On St. Patrick’s Day, the CPK Irish Mule is just $5. Enjoy a Lucky Jameson – an Irish version of a margarita – for just $5 in March. Claire’s is offering up to 50 percent off on St. Patrick’s Day items. Through March 17, you can buy one Blizzard and get another for just 99 cents, including the Blizzard of the Month, the Mint Oreo. You can get up to 30 percent off of St. Patrick’s Day décor and craft items at Hobby Lobby. In Kohl’s stores, the St. Patrick’s Day collection is on sale. Along with discounts, you may find buy-one-get-one-free options on select green apparel. All day on March 17, you can enjoy special food and drink options to celebrate St. Patrick’s Day. Through March 24, you can get your hands on a Shamrock Shake at McDonald’s at all participating locations. 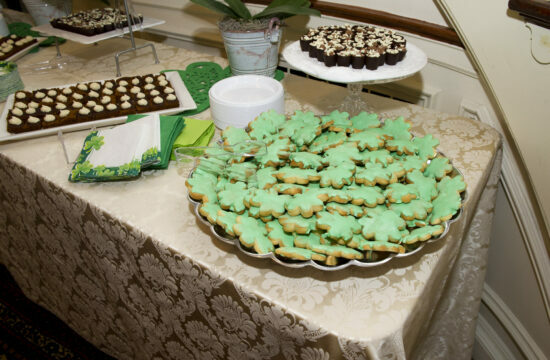 Shamrock-shaped cooks and a cookie cake with a St. Patrick’s Day theme are available at Mrs. Fields this month. Use the code MARCH to get an extra discount on qualifying orders. If you order from the special St. Patrick’s Day menu, available on March 16 and March 17, you can get items like corned beef and cabbage and green beer to help you celebrate the holiday. Ruby’s Diner’s shake of the month is the Mint Chocolate Shake. It is in honor of St. Patrick’s Day. By using the code STPAT20 at Spencer’s online, you can get 20 percent off of a single item. St. Patrick’s Day shirts, novelty glasses, hats, and party supplies are available at Target, including some items that are on sale. From March 15 to March 18, you can use a coupon code to get an extra discount on various Irish food items when you shop World Market online. St. Patrick’s Day is a big holiday for bars and clubs. It isn’t uncommon for there to be a variety of drink specials, entertainers, and themed snacks to attract patrons. Each bar or club usually sets their own St. Patrick’s Day specials. If you are considering heading out for a drink, contact your local options or check out their websites to see what they have planned. It is important to understand that deals may or may not be available from any given restaurant or store location. In some cases, a retailer or dining establishment may run out of freebie offerings early, so customers who arrive later in the day will miss out. Additionally, independent franchises may choose not to participate in a chain’s sale or daily specials. If you have your eye on a particular deal, it is wise to contact your nearest location directly to make sure they are taking part in the St. Patrick’s Day specials. How are you celebrating St. Patrick’s Day? Share with us in the comments below. This coming weekend is sure to be busy since the Irish holiday falls on a Saturday. Fortunately, it’s not the most expensive occasion on the calendar. 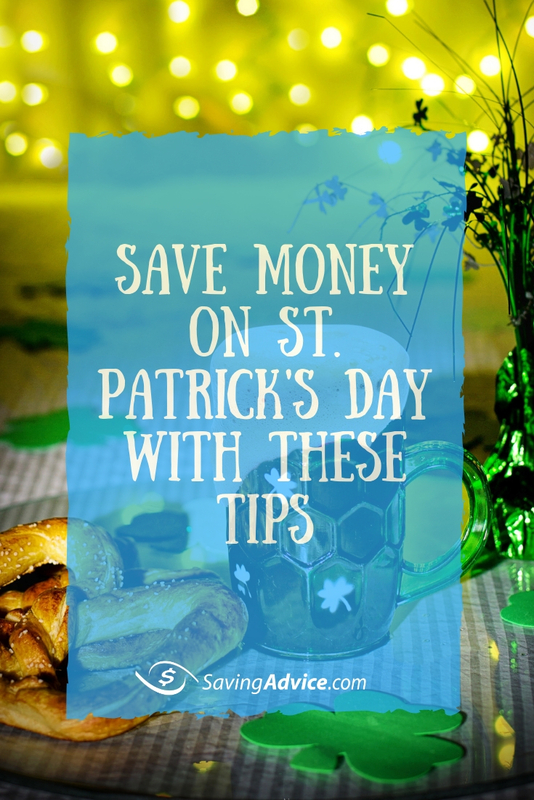 That said, here are a few ways you can save money on St. Patrick’s Day. 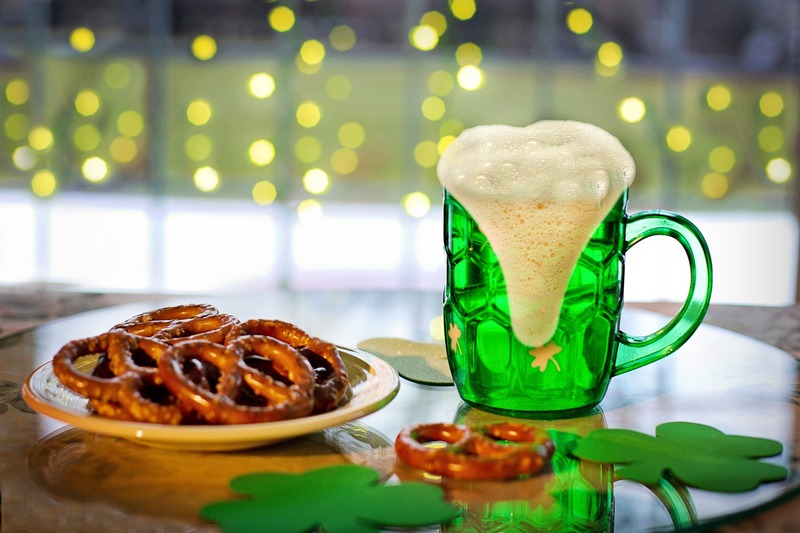 Start looking for deals before you imbibe any green beer that might weaken your inhibitions. Keep an eye out for restaurant promotions offering free, or seriously discounted, green foods, alcohol, and other holiday-themed items. Groupon — Save up to 75% on bar crawls, festivals and other celebrations over St. Patrick’s Day weekend; discounts also include deals on food and clothing as well. Living Social —This one has more local events and fewer large-scale deals, but it’s good for savings on restaurants and local festivals. Offline.com — Find out about bar crawls, holiday-themed 5Ks and other events — but know that there might not be any overt discounts like what you find on Groupon and Living Social. If you’ve already made plans for the evening, there are still ways to work savings into things. Here are a few ideas along those lines. You might be able to make an advance purchase of admission to any event you intend to go to — even a day or two might save you money on admission. This is especially true for 5K races, something that has become a popular St. Patty’s Day tradition. In many cases, you could save yourself 50% of the admission price if you purchase your spot early. Generally, the same is true of bar crawls, festivals, and other events. The closer you get to the day, the more you’ll pay. This is one night of the year when people have a tendency to go overboard with the drinking, but that makes the holiday a lot more expensive than it needs to be. One of the best ways to save money is simply pacing yourself on the booze. Choose cheaper drinks and drink water in between. Consider doing this even if you’ve prepaid for a bar crawl with a fixed price — that way you can make it through the entire night. Assuming you’re not going to an event with a fixed price for all you can drink, there’s no reason why you should buy all your booze at bars or restaurants. Of course, the beer you drink at home might not be green, but it doubtlessly costs less money than what you’d pay for it at a club. If you do start out with an aperitif at your place, be sure to line up a designated driver before you head out — or set aside money for a cab or rideshare service. Actually, you should do that even if you don’t start your drinking at home. With the holiday falling on a Saturday, people may be likelier to become intoxicated earlier in the day, increasing the risk that you might encounter drunk drivers on the road. Please don’t add to the chaos — don’t drink and drive or you might ruin an otherwise fun holiday. What do you have planned for St. Patrick’s Day weekend, readers? One of the most lucrative nights of the year for Lyft and Uber drivers — and one of the most expensive for riders — is coming up this weekend. And even a couple of localized St. Patrick’s Day ridesharing discounts barely make a dent in surge pricing during the holiday. Both Lyft and Uber‘s surge pricing strategy kicks in whenever demand for rides outpaces supply. This system can make fares get a little bit pricier during rush hour but tends to make them skyrocket during large festivals and holidays. In fact, surge pricing can result in up to double the fare you would otherwise pay during normal hours. That’s what makes so-called discounts on St. Patrick’s Day ridesharing turn out to not feel like a discount at all. That said, Lyft customers in the greater Phoenix area get 20% off of two rides during this weekend, thanks to a partnership with the Maricopa County Attorney’s Office that aims to minimize drunk driving incidents. New customers in the area can download the app and receive $5 off their first four rides by using the promotion code BELUCKY. Lyft’s usual offer for new riders gives $5 off two rides with the use of the code NEWUSER10. Meanwhile, $5 Uber discounts in the greater Memphis area are being financed by Hamilton Law Firm which is limiting availability to between 10:00 pm and midnight on March 17, not the entire weekend like the Phoenix discount. Also distinct from the Phoenix discount: The law firm asks people to fill out a form on its website in order to receive the discount code. Whether you live in one of the markets that has a discount available or not, there’s another way to save on the fare: choose the carpool versions of ridesharing — Lyft Line and UberPool. But even the pooled rides get more expensive as a result of surge pricing, so you might want to try taking a cab instead. Taxis usually don’t ratchet up their fare meters on holidays. 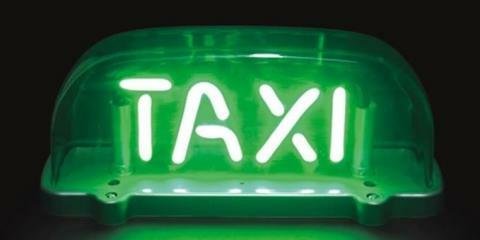 Although it might be challenging to find available cabs on the holiday known for heavy drinking — especially when it falls on a weekend like this year — once you get into a taxi, it can seem like a relief compared to the alternative. Here’s one reason why a cab will be nicer than doing Lyft Line or UberPool: You probably won’t know your fellow passengers in a carpool situation, and on a night like St. Patrick’s, one of these strangers just might barf on you in the vehicle. In fact, a veteran driver for ridesharing services advises his colleagues to stock up on vomit bags before signing on that evening. Know that the surge pricing on holidays like St. Patrick’s Day last longer than during times like rush hour. When it’s not a holiday or major festival, a period of surge pricing can last an average of five minutes, according to research put out by Northeastern University. In those situations, you can save money simply by waiting for the surge pricing period to end, although that option won’t work if you’re in a rush. It also won’t pan out on a holiday like St. Patrick’s Day, but you could always try it and see if anything changes. 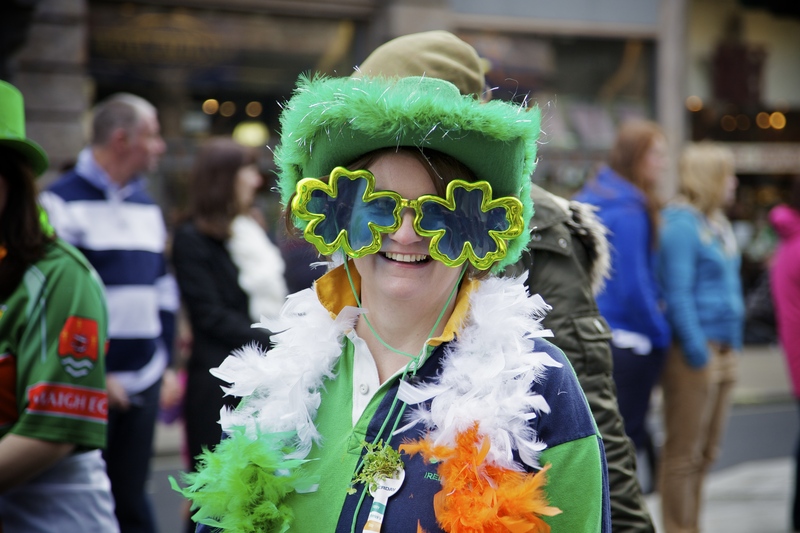 Readers, what do you have planned for St. Patrick’s Day? What has your experience been with surge pricing on ridesharing service? St. Patrick’s Day can be a fun holiday. In fact, many schools, restaurants and other places use the day as an excuse to have a celebration. Many places hold events where you can dress up. Schools oftentimes do worksheets and color and maybe even make St. Patty’s Day cards for the holiday. What makes the celebration even more fun is that you can get the majority of what you need for the holiday for free. If you look into your local events, you may discover that your town is having events in honor of St. Patrick’s Day. This may be anything from parades to fairs to crafting sessions without paying a dime. For example, in Miami, people are able to enjoy a Disco Fever party free of cost, get into many bars free and even see live music for free on St. Patrick’s Day. In Los Angeles, people can start drinking at 6 a.m. with Irish coffee and go on a pub crawl to celebrate the day. There will also be many festivals and small events throughout the day. You never know what may be going on near you. Some towns have already celebrated St. Patty’s Day, however, you can check your town’s calendar to discover whether any free events will be occurring near you. In addition to festivals, local restaurants and bars may be offering free admittance (clubs), free food and free drinks to patrons. Some places may even be offering green drinks and foods in honor of the day. Other restaurants may use the holiday as a day to raise money for their favorite charity. If you intend to go out and celebrate St. Patty’s Day, make sure you do what you can to save your wallet. You may be able to what you plan to do for absolutely no money at all. It never hurts to check! With any luck, St. Patrick’s Day will bring full bellies and full beer mugs. While there are Irish tunes, blessings, drinks, and colors splashed about our dining rooms and bars, there are also fun stories, legends and myths to share among our friends. Being the bookworm that I am, I looked into some of these money related golden tidbits picked up from across Ireland and scattered into American culture. Is there a pot of gold at the end of the rainbow? A rainbow is a scientific phenomenon by which the moisture in the atmosphere (note the word ‘sphere’) reflects sunlight. Gold and pots are unrelated to humidity, rain, and the shape of the earth, and thanks to Albert Einstein, we now know that matter and energy cannot appear and disappear from nothing. A leprechaun offering to help a poor couple taunts their greedy appetite instead with the promise of this gold found at this location. Due to the science of light refraction, you cannot actually perceive yourself at the end of the rainbow: the distance to the “end” always stays the same from where you are. Contrary to popular belief though, there is frequently an “end” to the rainbow. I have a photograph of this supposed full circle encountering the earth, where it comes between the vantage point and the mountainside in the background. Here is another photo with the science explained. Are there Emeralds on the Emerald Isle? Emeralds, due to the fact they are beryl (a clear mineral) with chromium and vanadium traces, and that these minerals are not commonly in the same layers of earth, are freaks of nature, brought about by years of evolutionary geologic forces like upheavals, erosion, and compression. Emeralds have grown in Africa, Egypt specifically; South America, Columbia famously; the Mid-Asian continent; and North Carolina. Ireland does not have the geological history or make up to have emeralds. The nickname does, however refer to Ireland’s geographical nature. The location of the island, against the western cost of the European continent, sets this piece of land under fog, rain, and other heavy moisture, which provides for lush green vegetation. Even the drier areas are inundated with wide, green views. Emerald comes to English from the Greek, through the French word “esmeralde” or “green gemstone,” Thus, a beautiful luscious green “gem” of an island. Is Corned Beef and Cabbage the meal of the common (not rich) Irishman? Pork, pheasant, and mutton were the meats of availability to the Irish. Even the story of preserving the beef for Easter dinner is reserved for the kings, or at least the extremely wealthy, or even for export. Cattle were raised in Ireland for their milk and thus, cheese and other dairy products are prevalant. Cabbage, on the other hand, was eaten, but not boiled: fried! Immigrants to America found beef and salt to be much cheaper commodities than their traditional bacon. Corned beef and cabbage became an Irish-American tradition, as did the celebration of St. Patrick’s Day as one of all things Irish. Some of the beef in American markets that was preserved by corning was, ironically, imported from Ireland. Are Leprechauns really hoarding gold? Legend has it if you manage to capture this fairy, keep your sight of him, and threaten to hurt him, he will lead you to hidden gold, buried as dogs bury bones. If you catch a leprechaun, remember they are tricky, and maybe we’ll find out the truth of this legend. 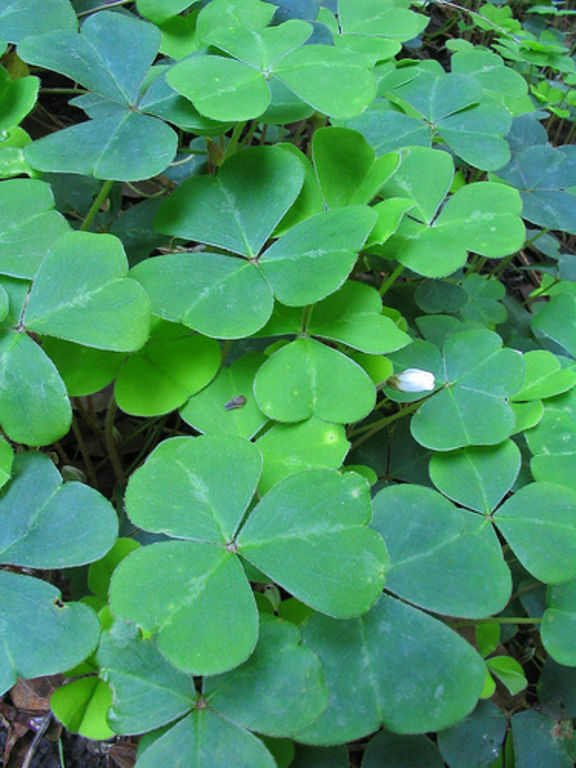 Though I find myself sitting on a big pile of “know-it-all,” I’ll still be looking to the far reaches of the rainbows, and I’ll still be wearing my lucky green three leaf clover. Although a bit of hope remains for a pile of sequestered wealth, I’ll have to wait for a visit to the beautiful Ireland to find my leprechaun. In the meantime, kiss an Irishman for good luck, and enjoy your St. Patrick’s Day in full American style. The Luck of the Irish to ya!